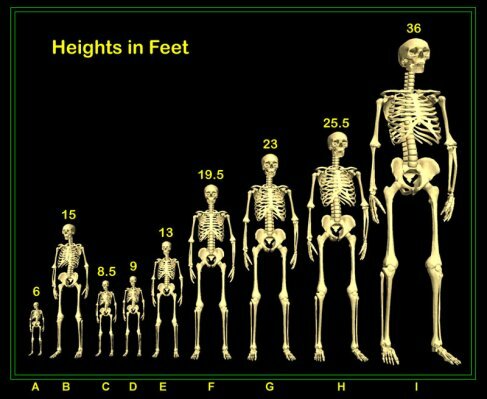 Often times we read or are read children's books about giants but it is done so in a matter that make us think it's all fairy tales and make believe, but there is some good evidence that giants were real. "20. (That also was accounted a land of giants: giants dwelt therein in old time; and the Ammonites call them Zamzummims; 21. A people great, and many, and tall, as the Anakims; but the LORD destroyed ...."
So where did these giants come from? According to Genesis Chapter 6 verse 4 from the sons of God. If you are interested in Giants but don't really want to just take the bibles account of them or if you want to see some hard evidence of bones and artifacts then I suggest you head over to genesis6giants.com - there is a wealth of info and pictures. 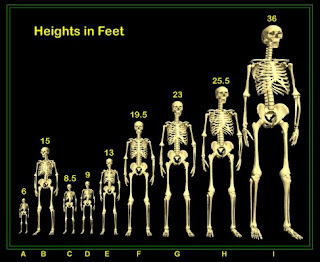 This theory of the giants (Nephilim) has also made it's way over into the bigfoot world. Some of the early reports from the Dr. Ketchum's bigfoot DNA study have been said to contain some kind of unknown "angel" DNA. Many people in the bigfoot community have claimed for years now that bigfoot was and is of the Nephilim race, while others totally dismiss this possibility. So I guess more study is needed on giants and bigfoot to see if the two can be connected in a more widely accepted way. While digging for artifacts of our past we may just solve a present day mystery. I'll settle for any DNA analysis released at all. That would illuminate a great deal, don't you think? yeah it would be helpful but I think most people will still want to see a dead bigfoot.